Venue booked, invites sent… what’s next? THE WEDDING CAKE! Over the years, the traditional wedding cake of alcohol-soaked fruit has started to diminish, being replaced with a variety of flavours. Recently, a new craze of cake has started appearing at weddings. Alternative wedding cakes! These beautiful statement pieces are for those who aren’t a fan of the usual sponge and icing and want something a little bit different, going for ingredients more suited to their palate. If you think about it, your wedding ‘cake’ can be made from anything. If it can be stacked and decorated to suit your colour scheme, all rules go out the window. 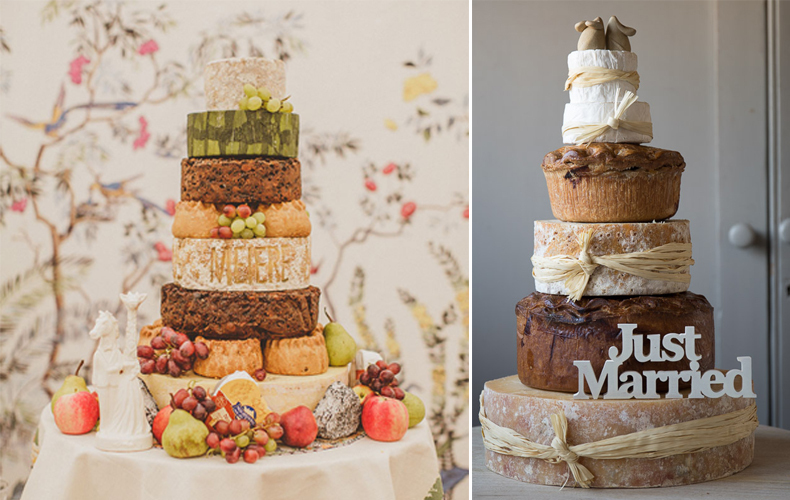 Here are a few inspirational alternative wedding cakes to get your creative juices flowing! If you are a cheese fan, you know the love is real. You watch videos of oozing cheese, can’t go without stealing a chunk or two whenever you open your fridge door and you have hour long conversations of various cheese that you have tasted in your life time. There are so many different cheeses out there, offering different sizes, shapes, colours, smells and flavours, it’s the perfect way to treat your guests (unless they’re lactose intolerant’). Either build one yourself by visiting your local farm shop or check out some of these delicious cheesy towers from high street retailers! Stepping towards a creamier cheese, why not indulge your guests with an actual cheesecake. These have the versatility and the sweetness of a sponge wedding cake, but with extra creamy goodness. Offering a slightly cheaper alternative, the wedding budget can stretch to a variety of cheese cakes for different tastes, giving you and your guests a choice of flavours. Many brides and grooms have caught onto the fact that you can stack pretty much anything to create a tower of deliciousness. This started off with cute cupcakes but has progressed into some fabulous cakes! This style is so much easier when it comes to handing out to guests. No cutting required, and friends and family can help themselves. Make sure you hold some back for yourself though, all is fair in love and cake. This style of wedding cake suits itself to a variety of shapes including a colourful stack of doughnuts, glamorous Ferrero Rochers, delicate macaroons or an oozing stack of brownies. Since the childhood days of messy cake making and eating marshmallow off the spoon, these deliciously gooey chunks of goodness have been given an upgrade and turned into wedding cakes! These can be created from multiple mini rice crispy cakes in a stacked fashion, or you can create 3 big cakes for a tiered wedding cake of dreams. Moving away from the sweet cakes, back onto something a little more savoury with Pork Pie Cake. Ideal for a more rustic looking wedding, these can be accompanied with a selection of chutneys, coleslaw and pickles. Classic, cool and utterly delicious. The thing we adore about weddings today, is that they can be whatever you want them to be. Long gone are the days where you were restricted by tradition. The choice is now based around you as a couple, with your tastes, hobbies and style being the focus. If you are looking for some creative inspirations, feel free to give our team a call on 01242 245 071 or email weddings@manorbythelake.co.uk.